_ Having lost their homes in the province of New York to the Yankees in the so-called American Revolutionary War just 30 years before, the refugee loyalist families of Dundas County had their homes threatened again when, in the fall of 1813, they found themselves in the path of the single biggest offensive in what was to become known as the War of 1812. The story describes the various skirmishes that took place along the Canadian shore of the St. Lawrence River as the largest army that had ever been assembled by the United States proceeded relentlessly through their farms on its way to capture Montreal. 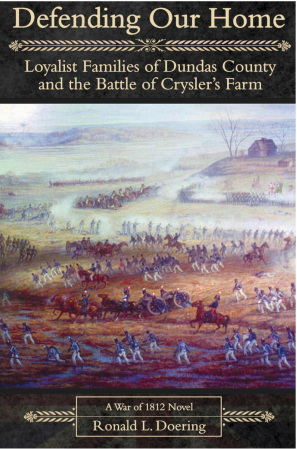 The story culminates with the dramatic Battle of Crysler’s Farm as seen through the eyes of the young Dundas County militiaman Thomas Marselis. The British regulars, Canadian militia and Mohawk warriors faced overwhelming odds, and the largest cavalry charge mounted during the war, in a battle that is one of the most important in Canadian history.